After the last boys and their coach were rescued on Tuesday, we look back at how the story unfolded in pictures. From nervous faces to joyous celebrations, here are some of the most striking images from the successful mission. The BBC's Howard Johnson is in Chiang Rai, where journalists from around the world are waiting outside the hospital. Volunteers who assisted the rescuers say they are thrilled by the news that the boys and their coach have all arrived safely. One of the team has a message for the boys: "Be cheerful and never give up". The BBC's Tessa Wong has posted a video showing jubilant scenes following the latest press conference. Journalists can be seen cheering "hooyah!" in celebration at the successful rescue. Earlier today, rescuers said they did not need inventor Elon Musk's mini submarine. "It doesn't fit with our mission to go in the cave," rescue operations chief Narongsak Osotthanakorn said. But the man behind SpaceX and Tesla says Richard Stanton, an elite British diver who was among the first to discover the boys, encouraged him to keep working on the vehicle. He posted what appeared to be email correspondence with the diver on Twitter. 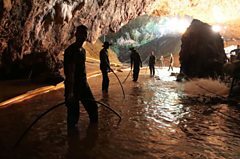 The Thai Navy Seals have just posted this picture of the last four people to get out of the cave system. They are three divers and a doctor - all Seals. They stayed in the cave for days supporting the young boys. Everyone is now out of the cave after an extraordinary rescue operation that has captivated the world. The rescue chief has just said all the Navy Seals - three divers and a doctor - are out of the cave. We do not have details about their exact condition, but this extraordinary rescue mission now appears to have come to an end. All the boys are in hospital and their families will visit them soon, Mr Narongsak said. "I can officially say that the rest of the boys have been rescued. Their parents are going home to take a shower and change. They should be able to visit the children through the glass tonight." Families have not yet been able to meet any of the rescued boys in person, due to a fear of infection. Instead they have had to stand behind a glass partition. The head of the rescue mission Narongsak Osottanakorn is speaking to reporters now. He said the remaining four Navy Seal divers, including a doctor, are almost out of the cave. "It shouldn't be more than 15 mins and they should be reaching the entrance," he said, to loud applause. As far as we know, four Thai Navy Seal rescue divers, including a doctor, remain inside the cave complex. They had gone in to support the boys after they were found on 2 July. The Navy Seals have called on the public to send their "best wishes". It's getting late in Thailand. We've been told there will be a press conference later but we don't yet know when. We will continue to bring you all the latest developments here. Our reporters have been blown away by the spirit of the many volunteers who have helped out behind the scenes of this mammoth rescue operation. And they are still going - Kanokporn Beayjarat has been handing out ice-cold drinks to journalists outside the hospital in Chiang Rai. The last ambulance has arrived at the hospital in Chiang Rai, the BBC's Howard Johnson says. It means the final four members of the team, plus the coach, now join the eight others who were rescued over the previous two days. The first eight have undergone X-rays and blood tests, and will remain under observation for at least seven days. They are said to be in good mental and physical health. Some of the boys have now seen their families, but only through a glass panel in the hospital as medical staff want to protect them from possible infections. Over the past week we have called in to chat to Nopparat Kanthawong, the head coach of the Wild Boars football team, and usually found him talking tensely on the phone to parents of the boys. He went over and over the events of the day the boys went into the caves with his assistant after football practice. He says he had no idea they were going. Tonight there was an entirely different atmosphere in the house, just below the mountains where the men who run the Wild Boars meet. They laughed, shouted cheers and shook hands in a very un-Thai way. And coach Nop was smiling for the first time, and almost speechless. "I don’t know what to say – I just want to see them, and hug them," he told me. I was then able to show him a note from Manchester United to the rescued boys. It was an invitation to visit Old Trafford next season, as most of the boys are passionate Man U fans. There was a little disbelief, and then elation, even from coach Nop, who admits he is a Liverpool fan who has failed to convert the rest of his team. "Is this for real?" they asked. The BBC's Howard Johnson posted this video showing an ambulance arriving at the hospital in Chiang Rai to the sound of cheering. Footballer Kyle Walker has offered to send the boys England shirts following the news of their rescue. The defender is preparing to face Croatia tomorrow in a World Cup semi-final. Video footage of the boys first emerged last week, with one of them appearing to be wearing an England football shirt. The young footballers had been invited by Fifa to attend the World Cup Final in Moscow on Sunday. But their attendance was always a long shot, given the health risks they face after spending more than two weeks in a pitch-dark cave. Fifa has just told the BBC that the boys will not be making the match. FIFA would like to express its great joy at the news of the rescue of the 12 young footballers and their coach. We would like to convey our profound gratitude to all persons involved in the rescue operation, which unfortunately took the life of one of the divers. Our thoughts are with his family. We have been informed by the Football Association of Thailand that due to medical reasons, the boys will not be in a position to travel to Moscow for the FIFA World Cup final. FIFA's priority remains the health of everyone involved in the operation and we will look into finding a new opportunity to invite the boys to a FIFA event to share with them a moment of communion and celebration. We can also confirm that a meeting with the Football Association of Thailand is scheduled to take place in Moscow around the FIFA World Cup final. This is the moment Mission Impossible became Mission Accomplished. Families in Chiang Rai gathered at the hospital to watch the final ambulances bring in their precious cargo. Some said they couldn’t believe it, others claimed they never lost hope. All wore the brightest of smiles. Scores of reporters rushed to their live positions to bring the news to their audiences at home. Japanese and Brazilian networks were either side of us. Up on the 8th floor, the doctors who declared this morning that the first eight boys to be rescued are doing well will now be examining their remaining teammates and their coach. Psychologists will be being assessing the impact a fortnight trapped underground has had. 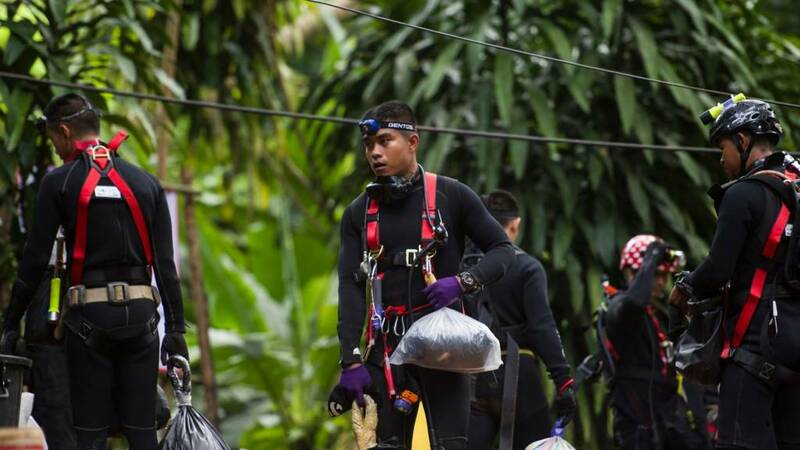 Petty Officer Saman Gunan, a former Thai navy diver in his late thirties, died on 6 July while helping to re-supply the cave with new air tanks. He ran out oxygen and lost consciousness. 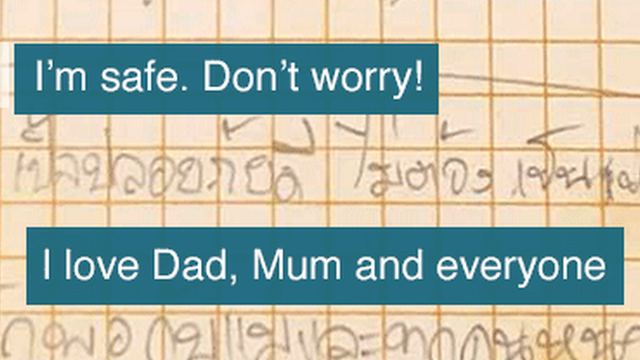 BBC Thai spoke to his family after his death. "I really loved him," his wife Waleeporn Gunan said. "Every day before he left for work, we said we loved each other. At midday, we'd text to see if the other had had lunch. "I want to tell you honey, you are the hero in my heart, you always were and always will be."